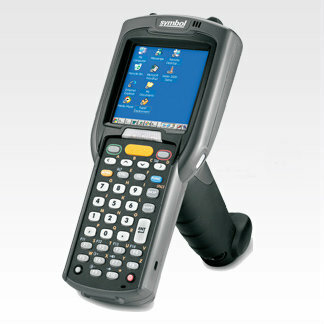 The gun configuration of the MC3000 handheld mobile computer is small, lightweight and rugged for applications requiring high-quality data capture and high-performance real-time computing. Customizable to the demands of each jobs, it allows employees to complete their work faster and with better results. The pistol grip is ideal for scan-intensive environments, maximizing comfort for your workers throughout a shift. This device is ideal for bar code scanning and wireless mobile computing within retail stores, warehouses, on loading docks, postal routes and any location demanding application performance and ruggedness. Provides visual in addition to audio feedback without having to reorient the device. Withstands multiple 4-foot (1.2-m) drops to concrete and up to 500 tumbles.